ThunderShirt helps your dog or cat in stressful situations! A lot of people don't know it but dogs can suffer from anxiety just like people. This is true of all breeds. If the problem is not addressed, it can lead to serious behavioural problems. There are different causes of dog anxiety but ageing, fear and separation are the most common. 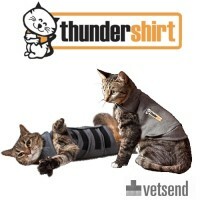 Thundershirt is a brilliant solution for stress in cats and dogs. It used to be that while they noticed that their furry friend had anxiety, owners did not know how to help solve the issue. This was the case for Phil Blizzard whose pet Dosi would get very anxious when fireworks season started or when there were thunderstorms. Phil knew no answer until a friend gave him what the thought was an odd solution. He suggested that Phil wrap his anxious pet snugly just like one would swaddle an infant. Desperate enough and at the end of the tether, Phil gave it a go. He got Dosi into an old t-shirt and used packing tape to give it a snug fit. He was amazed to see the mild pressure calm his beloved Dosi down almost immediately even during a storm. It was from this seemingly odd solution that Thundershirt for Dogs was created. Thundershirt has gone on to help a lot of restless dogs and their owners who were equally anxious about it. 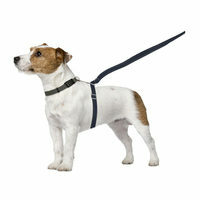 Thundershirt for dogs or thunder jacket for dogs works in a very simple way. It applies gentle, constant pressure similar to the gentle pressure a child feels when they are swaddled. It is very easy to do; you put a Thundershirt on your pet and you will see it calm down right away. This simple solution has a success rate of over 80% as reported by vets, trainers and owners. It has been independently studied by Dr. Temple Granin and other scientists who have confirmed its viability. Thundershirt is also a much better solution compared to using medication, according to some that have tried the Thundershirt on their pets. The Thundershirt Classic Dog Anxiety Jacket is the original dog calming solution. It has a patented design that applies gentle and constant pressure which works to calm anxiety, fear and over-excitement no matter its cause. It can be used during a visit to the vet, when there's a thunderstorm, when a pet has separation anxiety, during travel and all other anxiety-inducing situations. There is also the polo dog anxienty vest. It comes in different colours with a choice of bright or subtle colours. The difference is the polo design. If you are wondering about how long you will be able to use your dog anxiety vest for, don't be. Thundershirt is breathable for the sake of comfort, it can be washed as often as necessary and is made of a hard wearing fabric. While a Thunder jacket for dogs is effective in calming down an anxious dog, you may want or need something more such as when your pet is ill or injured or more aggravated than usual for one reason or another. You can use Thundershirt with other medicines or supplements including essential oils, calming spray or a calming diffuser. 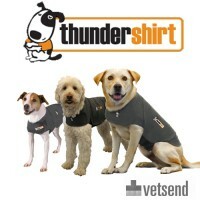 Using Thundershirt along with other natural solutions works for such times as Bonfire Night or New Year's Eve. From the anxiety of one beloved pet and its owner's willingness to try anything, there has come a solution that has helped so many other dogs and their owners. Calm down your four-legged friend down with this natural solution with proven results that is very easy to do, effective and inexpensive.